The Maine Department of Education is currently working with the state’s institutions of public higher education to define college and career readiness. Maine allows students to earn dual credit for academic and/or CTE courses through a general dual- enrollment program or a dual- enrollment CTE program, the latter for students in Grades 11 and 12. Public postsecondary institutions are required to accept the general dual-enrollment program credits, but it is unclear if this also applies to the CTE program (Education Commission of the States, 2015). The University of Maine at Fort Kent will become Maine’s pilot site for an Early College High School based on the Early College High School Initiative model. More information about Early College High School opportunities in Maine is available at the Maine Department of Education website (Maine Department of Education, 2012). For more information on CTE in Maine, view the Main Department of Education website. 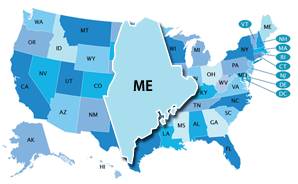 Maine does not have a statewide system for career exploration or career plans at the K–12 level. Some academic programs require more courses in mathematics and/or science beyond the requirements listed above. Maine’s state-specific Early Warning System is called the Maine At-Risk Data Mart. Early Warning System data are reported at the student and district levels to teachers.